Baby bunnies may start their lives in a child's Easter basket, but after growing larger, many rabbits are taken to animal shelters for adoption. If you end up giving a home to a surrendered bunny, you will no doubt wonder how old it is. Once a rabbit is mature it's difficult to accurately determine its age, but there are some clues to look for. Look in the rabbit's mouth. The saying "never look a gift horse in the mouth" was drawn from the fact that you can usually get a clue about how old a horse is by looking at its teeth. An older horse will have longer and more stained teeth. The same holds true, somewhat, for rabbits. An older rabbit's teeth won't be longer, but will be yellowing or brownish. Young bunnies have whiter teeth. Pick up its paws. 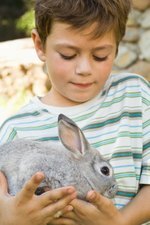 An older rabbit will have thicker, tougher, more scaly claws than a younger one. Younger bunnies have fine, smooth claws. Watch the rabbit's behavior. Hyperactivity, frantic digging and chewing on anything and everything can indicate the bunny is still a teenager. Rabbits usually become mellower with age; while still curious, older rabbits will move more slowly and sleep more.